After several weeks of violent protests across France, particularly those in Paris which turned the capital into a battle zone, President Emmanuel Macron finally buckled and announced his government will suspend a controversial fuel duty rise. French Prime Minister Edouard Philippe will announce the suspension today, according to a government source, after escalating violence and public outrage against the French president’s economic reforms caused the government to lose control over the citizens. The violent protests posed the most formidable challenge yet to Macron’s presidency. 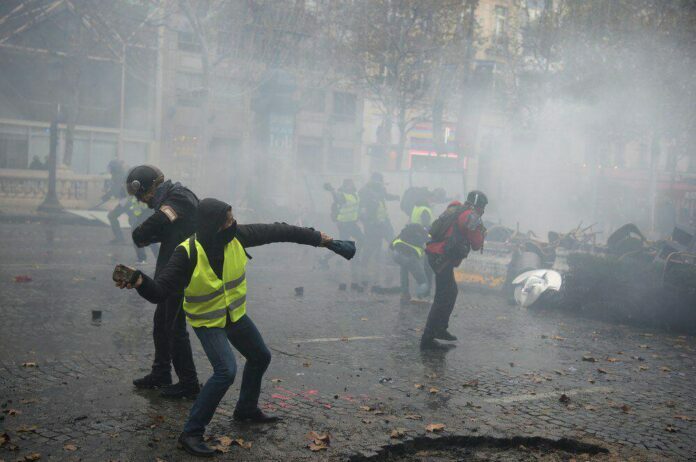 According to French finance minister, three weeks of “yellow vest” protests strongly influenced the country’s economy, with trade in retailers, hotel chains, high-street stores, and restaurants significantly falling as a result of the unrest. Bruno Le Maire said Monday the impact was severe and ongoing. The protests have taken on a name of its own: the “yellow vest” protests, a reference to the vests worn by people active in the transportation industry. French ambulance drivers on Monday joined the nationwide protests. They blamed the 40-year-old President Macron, whom they see as detached from the everyday struggles of ordinary people, for their woes. Riot police, however, used tear gas to disperse the drivers demonstrating against a new medical transport finance reform in Paris. Protesting ambulance workers demand the suspension of the new medical transport finance reform, which they say undercuts smaller ambulance companies. At least 100 ambulance workers used their vehicles to block a bridge leading to the National Assembly, with paramedics screeching sirens and blocking access to the square from Rue de Rivoli.